Wilson Montessori K-8 will receive a new $18.9 million addition and general renovations of the existing facilities to accommodate 750 to 900 students. The three-story building addition will feature flexible learning centers, multipurpose rooms, and a new dining area which connects to the existing building. Construction on the project is expected to begin in the fourth quarter of 2016 and take about 16 to 24 months to complete. This entry was posted in 2012 bond, District VII - Anne Sung and tagged BuildHISD, wilson montessori on January 5, 2016 by HISD Communications. Parents, neighbors, and HISD administrators on Monday gathered at Wilson Montessori K-8 for the first of three community meetings to discuss a proposed new addition and renovations to the school under the 2012 bond program. This entry was posted in 2012 bond, 21st century schools, District VII - Anne Sung and tagged 2012 bond, wilson montessori on September 22, 2015 by HISD Communications. Project Advisory Teams for Garden Oaks Montessori, Pilgrim Academy and Wilson Montessori spent two days last week in a design charrette, where they worked with architects and facilities planners to put together initial design concepts for their schools. This entry was posted in 2012 bond, 21st century schools, District I - Elizabeth Santos, District VII - Anne Sung and tagged 2012 bond, 21st century schools, Garden Oaks Montessori, Pilgrim Academy, wilson montessori on May 6, 2015 by HISD Communications. Administrators are recommending that the HISD Board of Education authorize the district to negotiate design contracts with 13 firms on the remaining 14 projects within the 2012 bond program. The latest round of contract recommendations comes ahead of schedule in response to the booming construction market in Houston. Although architect selections for schools in Groups 3 and 4 of the program weren’t slated to take place until next year, the district wanted to move forward as quickly as possible to minimize the impact of escalating construction inflation. This entry was posted in 2012 bond, Board of Education and tagged 2012 bond, Askew ES, Austin HS, Garden Oaks Montessori, Jordan HS, Kashmere HS, Madison HS, Pilgrim Academy, Sam Houston HS, Sam Houston MSTC, Scarborough HS, sharpstowninternational, Westbury HS, Wharton Dual Language Academy, wilson montessori, YWCPA on October 1, 2014 by HISD Communications. 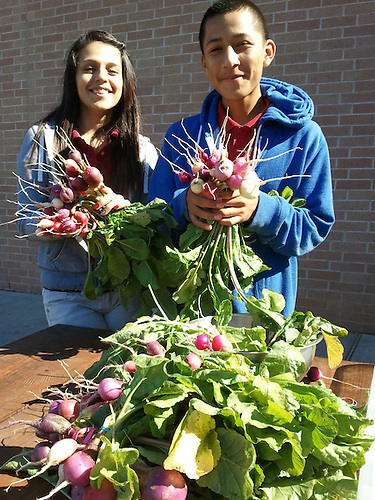 You can stock your kitchen with fresh veggies and help students from nine Houston ISD schools learn how to grow produce and sell it by shopping at the Whole Kids Farmers Market at Whole Foods’ Montrose store, 701 Waugh Dr. (at West Dallas), from 10 a.m. -1 p.m. on Saturday, March 29. This entry was posted in Elementary Schools, High Schools and tagged Briargrove ES, Garden Oaks ES, Gregory-Lincoln Education Center, Helms ES, Jefferson Davis HS, Kolter ES, Travis ES, Westside HS, wilson montessori on March 24, 2014 by HISD Communications. Six of the top ten students in the Think Through Math summer competition came to a reception held in their honor on Nov. 5. From L–R are: Saide Christoffel, Jésus Mendez, Patrick Han, Alexander Chin, Aldo Ortega, and Drayton Gober. Ten students’ passion for solving math problems over their summer vacation has helped bring HISD first-place honors and bragging rights as the top district in its division of Think Through Math’s (TTM) “2013 Texas Math—Everybody’s Doing It!” competition. The contest lasted from June 10 until Aug. 9, and districts from all over the state participated by having students complete math lessons to earn points. This entry was posted in Achievement/Recognition, Elementary Schools, Middle Schools and tagged Cunningham ES, Grady MS, Lovett ES, Oates ES, Pershing MS, Pin Oak MS, Think Through Math, wilson montessori on November 6, 2013 by HISD Communications.